A US Marine Corps M88A2 Hercules in 2014. The M88A2 is lifting an M1 Abrams engine using the M88A2's crane. An armoured recovery vehicle (ARV) is typically a powerful tank or armoured personnel carrier (APC) chassis modified for use during combat for towing or repair of battle-damaged, stuck, and/or inoperable armoured fighting vehicles, such as tanks and armoured personnel carriers (APCs). Most ARVs have motorized tracks, like a tank or bulldozer, enabling the ARV to operate on uneven ground. The term "Armoured Repair and Recovery Vehicle" (ARRV) is also used. ARVs may have winches, jibs, cranes, and/or bulldozer blades to aid in tank recovery. Typically, any specialized lifting and recovery equipment replaces the turret and cannon found on a regular tank. ARVs may in some cases have electric generators, blowtorches, chainsaws and fuel pumps to help with recovery operations, or spare parts, to facilitate field repairs. Some ARVs have a spade component to anchor the vehicle when it is towing or lifting. Since most ARVs are based on tank or APC chassis, they have an armored crew cockpit and engine, which means that ARVs can be operated in combat conditions. Rarely, an ARV may be armed, such as some M32s, which have an 81 mm mortar for screening purposes, and the M88, which has a .50 cal heavy machine gun. One WW II Sherman-based ARV had a dummy gun installed where the turret would normally go. Early ARVs in WW II were often repurposed tanks, with the turret and cannon removed and replaced with some type of winch. In the 2010s, ARVs are generally factory-built. Even so, ARVs often use a shared chassis that is used on an army's other fighting vehicles, as this facilitates repair and maintenance of the ARV (as parts from tanks using the same chassis can be used to repair the ARV). Some ARVs are operated in tandem with armoured bulldozers. ARVs generally can only tow an equivalent-class vehicle or one that is lighter in weight. As such, an APC chassis-based ARV can only tow and recover an APC, but not a much heavier tank. While most ARVs are made from or based on APC or tank chassis, more rarely, an ARV may be based on an artillery tractor chassis. Some ARVs have specialized equipment that enables them to operate on beaches or in shallow water. Chinese Labour Corps men and British soldiers removing parts from a Mark IV tank at the Central Stores of the Tank Corps, Teneur, spring 1918. During World War I, some British Mark IV heavy tanks were fitted with jibs to produce "salvage tanks", but the majority of their work was at the tank parks in aid of moving, maintaining, and repairing damaged tanks. The first true ARVs were introduced in World War II, often by converting obsolete or damaged tanks, usually by removing the turret and installing a heavy-duty winch to free stuck vehicles, plus a variety of vehicle repair tools. Some were also purpose-built in factories, using an existing tank chassis with a hull superstructure to accommodate repair and recovery equipment. 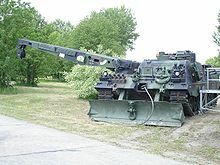 Many of the latter type of ARV had an A-frame or crane to allow the vehicle's crew to perform heavy lifting tasks, such as removing the engine from a disabled tank. After World War II, most countries' MBT models also had corresponding ARV variants. Many ARVs are also equipped with a bulldozer blade that can be used as an anchor when winching or as a stabiliser when lifting, a pump to transfer fuel to another vehicle, and more. Some can even carry a spare engine for field replacement, such as the German Leopard 1 ARV. An ARV crane can also be used to lift concrete fortifications and other battlefield engineering tasks. ARVs are normally built on the chassis of a main battle tank (MBT), but some are also constructed on the basis of other armoured fighting vehicles, mostly armoured personnel carriers (APCs). ARVs are usually built on the basis of a vehicle in the same class as they are supposed to recover; a tank-based ARV is used to recover tanks, while an APC-based one recovers APCs (it does not have the power to tow a much heavier tank). ARVs with a crane can be used to lift and place concrete fortifications in place and help with other battlefield engineering. Some combat engineering vehicles (CEVs) are based on ARVs. The following is a list of ARVs by country, either designer/manufacturer or user. Anoa ARV - Indonesian recovery/engineering vehicle based on Anoa APCs featuring a 12-ton telescopic crane, 6-ton winch, chainsaw, blow torch and an electric generator. M113A1-B-Rec - recovery vehicle with a heavy internal winch. Similar to M806. Supplied by Sabiex, Belgium. M113A1-B-MTC - Maintenance vehicle with hydraulic HIAB crane. Similar to the M579. Supplied by Sabiex, Belgium. Bergepanther (Sd.Kfz. 179) - PzKpfw V Panther chassis 347 produced (1943 to 1945). Bergepanzer 38(t) - Jagdpanzer 38 chassis, 170 produced (1944 to 1945). Bergepanzer M74 (Sherman Chassis) - first TRV/ARV of the West German Bundeswehr, 300 used 1956-1960 (see M74 entry under United States). Bergepanzer 1 - M88 Chassis, the first of 125 entered service in 1962 and a 1985 modernization program replaced the gasoline engine with a diesel and improved the hoist. Bergepanzer 2 - Leopard 1 tank chassis. Used by the Canadian Forces since the 1990s as Taurus ARV. Bergepanzer Wisent - Bergepanzer 2 chassis. Modified and upgraded by Flensburger Fahrzeugbau to support the demands of the future battlefield. Optimised to support the Leopard 1 and 2 main battle tanks. Bergepanzer Wisent 2 - Leopard 2 chassis. Successor of the Wisent. Build by Flensburger Fahrzeugbau. Trail Blazer (Gordon) (Sherman chassis) - An IDF recovery/engineering vehicle based on HVSS equipped M4A1s Sherman tanks, it featured a large single boom crane (as opposed to the A-Frame of the M32) and large spades at the front and rear of the vehicle to assist in lifting. It could also tow up to 72 tons. Nemera - modern recovery vehicle based on Merkava tank chassis. Several prototypes have been built, but it never fielded in large number in the IDF. The current ARV in IDF use is the American-made M88 Recovery Vehicle, which is accompanied and assisted by an IDF Caterpillar D9 armoured bulldozer. M32 Chenca (Sherman chassis) - In 1998, Napco International of the USA upgraded M32B1 TRV M4 Sherman-chassis armoured recovery vehicles with Detroit Diesel 8V-92-T diesel engines (see M32 entry under United States). M-84ABI - The ARV based on Yugoslav/Serbian M-84 MBT. The Russian acronym BREM (cyr. БРЭМ) stands for "бронированная ремонтно-эвакуационная машина", literally "armoured repair and recovery vehicle". The British tested their first ARV designs in early 1942. The decision at the time was to focus on the Churchill infantry tank as the basis, but cruiser tank based ARVs were also produced. When the UK received supplies of US medium tanks - first the M3, then M4 Sherman, conversions were made of these to operate alongside and so simplify support. Sherman III ARV I - Armoured Recovery Vehicle conversion of Sherman III (M4A2), similarly "Sherman V ARV Mark I" and "ARV Mark II"
Sherman ARV II - conversion of Sherman V with dummy gun in fixed "turret", 7.5 ton jib at front, spade earth anchor at rear. Sherman II ARV Mk III was a M32B1 TRV (see US ARV). Challenger Armoured Repair and Recovery Vehicle (CRARRV). The CRARRV has a large set of recovery and heavy repair tools including a man portable ultrathermic cutting system with an underwater cutting capability and a portable welding system. A Sherman tank-based Beach Armoured Recovery Vehicle (BARV) tows two disabled vehicles on a beach. The BARV is a British military support vehicle, the name coming from "Beach Armoured Recovery Vehicle", for working in shallow water. BARVs were used to free operational vehicles that were stuck, and to clear the beach of inoperable vehicles or landing craft, to make way for other forces. Various models were based on the M4A2 Sherman, Centurion and Leopard 1A5 ("Hippo") tank chassis. Australia converted a M3A5 Grant to a BARV configuration. The first BARV was a Sherman M4A2 tank which had been waterproofed and had the turret replaced by a tall armoured superstructure. Around 60 were deployed on the invasion beaches during the Battle of Normandy. The crew included a diver whose job was to go underwater to attach towing chains to stuck vehicles. An M578 Light Recovery Vehicle. Note the heavy machine gun mounted on top, for self-defense. M32 Tank Recovery Vehicle, or M32 TRV, based on the Sherman tank chassis with turret replaced by fixed superstructure, 60,000 lb (27,000 kg) winch and an 18 feet (5.5 m) long pivoting A-frame jib installed. An 81 mm mortar was also added into the hull, primarily for screening purposes. M32B1 - M32s converted from M4A1s (some converted to M34 artillery prime mover tractors). M32A1B1 - M32B1s with HVSS, later removing the 81 mm mortar and incorporating crane improvements. M32B2 - M32s converted from M4A2s. M32B3 - M32s converted from M4A3s. M32A1B3 - M32B3s brought up to M32A1B1 standard. M32B4 - M32s converted from M4A4s. M74 Armored Recovery Vehicle - Upgrade of the M32 to provide the same capability for heavier post-war tanks, converted from M4A3 HVSS tanks. In appearance, the M74 is very similar to the M32, fitted with an A-Frame crane, a main towing winch, an auxiliary winch, and a manual utility winch. The M74 also has a front-mounted spade that can be used as a support or as a dozer blade. M74B1 - Same as the M74, but converted from M32B3s. M578 Light Recovery Vehicle (LRV) - based on the M110 chassis. M51 Heavy Recovery Vehicle - based on the M103 heavy tank chassis. M88 Recovery Vehicle - based on the chassis and parts of the automotive component of the M48 Patton & M60 Patton. ^ AFV Profile No. 3 Tanks Mark I - V Profile Publishing.